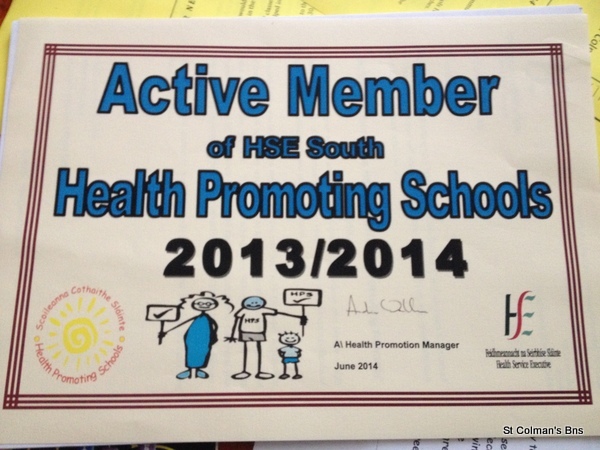 Health Promoting School - St Colman's Boys' School, Kanturk. In the school year 2015 / 2016 we will continue to promote both Healthy Eating & Being Active. One major step in our Healthy Eating Policy is to have a total ban any nut products in our lunch boxes. 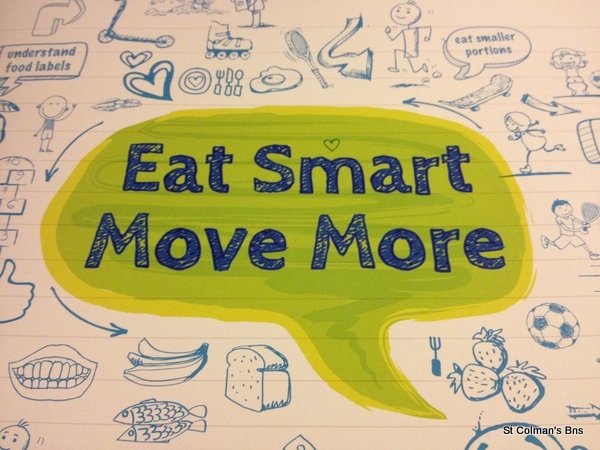 In the school year 2014 / 2015 we continued to promote both Healthy Eating & Being Active. We applied for our Active School Flag in June 2015. Read about St Colman's as an active school HERE. This year both Staff & 6th Class pupils had a talk on the Importance of Good Mental Health. The 6th Class blogged about it HERE. The Staff also attended a Well Being Seminar organised by the INTO. In June 2015,In June, we signed up to take part in Super Troopers, which is a programme being run in schools by Laya Healthcare. The goal is to increase childrens activity levels, while encouraging healthy eating and learning about the human body. 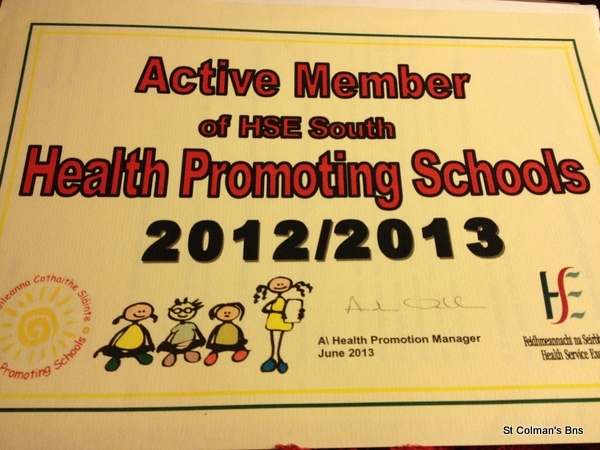 In June 2014 we received the good news that we have been awarded the Health Promoting School Flag. This was a 2 year process. Last year we concentrated on Healthy Lunches & Healthy Eating in general. This year we worked on our fitness and becoming more active. Well done to all those involved! Our school is an active member of the H.S.E. South Health Promoting Schools. 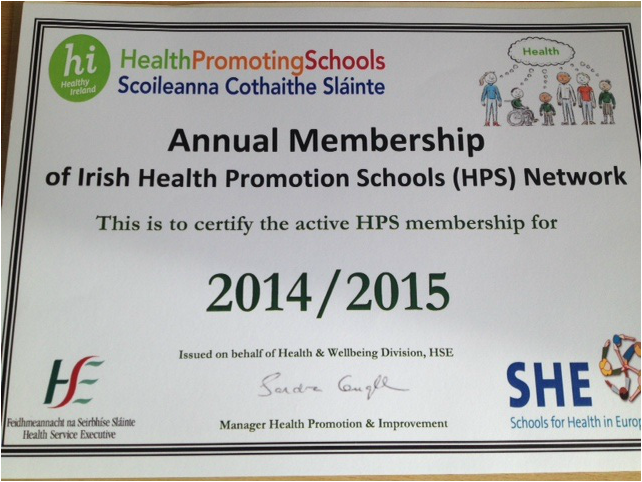 A Health Promoting School (HPS) is about giving the school a special focus on Health. There are 5 main parts to the HPS. Every effort is made to make the school as clean, safe and attractive as possible. We have an Anti-Bullying ethos in our school. We put huge emphasis on RESPECT and INCLUSION of all. A HPS decides on a plan of action for a physical, social & learning environment that promotes a healthy life for everyone. Developing & Implementing a Healthy Eating Policy in our school. Healthy Eating. We hope to organise different events each term to encourage Healthy Eating. Managing Litter & Waste. We hope to continue our emphasis on " RECYCLE & REUSE". To encourage MORE Physical Activity in our lives both at School & at Home. Again we hope to organise different "Physical Activity Events" throughout the school year. To learn more about ENERGY and how to Conserve it. We will have 3 Committees this year working hand in hand to make our School a Healthier, Safer & Happier Place to be. "Ní neart a chur le chéile."